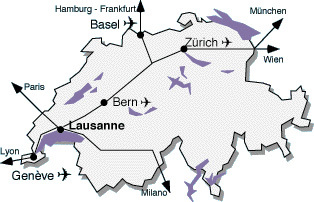 Take the highway and follow the direction of Lausanne, until you arrive near Lausanne. Stay on the highway and follow the direction “Genè” until you find a sign indicating “Lausanne Sud”. Then proceed as above. However, note that parking at the EPFL is usually a problem. The best solution is to use public transportation. If you have to come by car, you should use the official parking place at the “Coupole” in the center of the EPFL. Assuming that you could manage to reach Lausanne’s railway station, you are about twenty to thirty minutes far from us. You can go to the EPFL by taxi (quite expensive) but we would suggest that you use public transportations. A metro station is located just in front of the railway station (main street, opposite side), beside a McDonald’s. Buy a ticket (CHF 2.20, this ticket is valid for one hour for an unlimited number of changes) from one of the vending machines or from the ticket counter. Take the metro uphill, in the direction of “Centre-Ville”. Go out two minutes later at “Lausanne-Flon” (you cannot miss it since it is the only stop in that direction). In “Lausanne-Flon”, transfer to the TSOL (the other line). There is one departure every 10 minutes (you can take a look at the timetable of the TSOL, see below) and only one possible direction. Go out after 13 minutes at the stop “EPFL” (from Lausanne-Flon, this is the 9th stop). Where to buy good swiss chocolate ?